It's back to normal today, back to work & I have a card to share! This fun little offering was made for my parents anniversary! Wrinklies At The Movies CD. the movies, so it worked well for them! The base is 8"x8" Kraft cardstock. The Papers are from the My Minds Eye, Best Of Paisley Paperstack. I kept the layout fairly simple, adding a couple of bits of ribbon & some lace. The stars were punched using an amazing Fiskars Punch that I won! I then embossed them using the Cuttlebug Swiss Dots folder. I added a sheer bow to finish it off. As you can see from the photo, I decorated the inside of the card too! Thanks for popping by, I hopeyou like it! 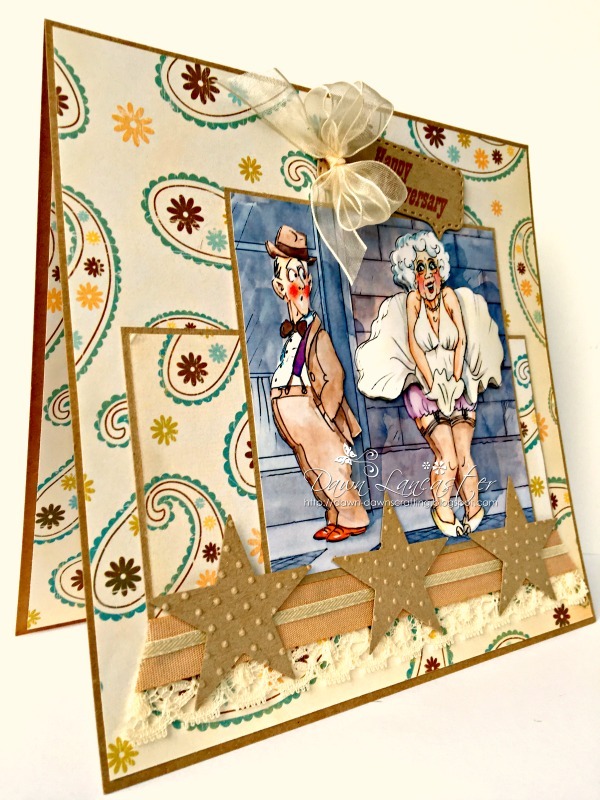 Crafty Hazelnut's Patterned Paper - Anything Goes with Patterned Paper. Dies R Us Challenge -Doily and/or Lace. Fun with Shapes - Lace. Sparkles Forum Challenges - Lots of Layers. My Time to Craft -Embossing (heat or dry). Fabulous card, love the La Pashe images and the stars giving it even more of a movie theme. Fabulous I love all your La Pash cards. Hiya Dawn, hope you enjoyed the festival ? Such a brilliant and fun card, love the images. Wow, this is such a fun and great card!! Oh Dawn this is just FABULOUS! They are going to LOVE IT!!! Great job and what fun! Thanks so much for playing in our ‘Doily and/or Lace’ challenge at Dies R Us! Please come back again soon! Lovely to hear you had a wonderful time Dawn. I hope your first day back at work went okay. A gorgeous card, love the image and beautiful papers. I love it Dawn! This really shows that you can combine CD crafting with designer paper pads and end up with a great card. Thank you for joining in the challenge this time. What a lovely card for an anniversary, I love your card and great images. A brilliant card Dawn, such a fun image and great papers. I'm so pleased that you enjoyed your week. Hi Dawn - lovely to see you again. What a great interpretation of our challenge. I love the images on this CD and I am glad it went down well with your parents. You have to know the people you send these too. A great card and thank you for joining in with us. Such a fun and bubbly card, love the images!! Thank you so much for joining us in our Doily and/or Lace challenge at Dies R Us! Hope to see you in the next challenge! Have a wonderful day! Lovely card with a fun image and great design, thanks for sharing at MTTC. What a fabulous fun image and I love that backing paper. Thank you for sharing with us. 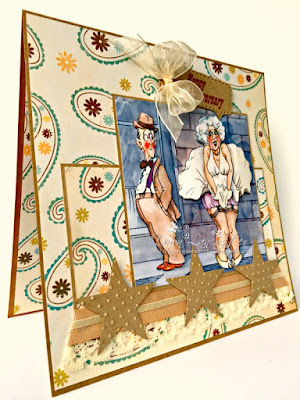 Smiling over your fabulous couple image set atop the patterned paper! Anniversary awesome! Thank you for sharing your creativity in the Inkspirational gallery! I think this is a fantastic card for a parents' anniversary, Dawn! Love the papers you chose. Brilliantly designed card.bet they loved it. fabulous designed card, love the papers and that lovely fun image, thank you for sharing it with us at Sparkles Monthly, hope to see you again next time..
Super card Dawn, love the image and papers! Gorgeous Dawn. I have joined the paper playful volunteers, I haven't got the pencil to get onto the daily listings. I emailed Alicia when she sent me the invite. Super cute card, I love the design and the images. Lol Dawn, this is so funny. Love his expression.